Hans-Horst Konkolewsky of the Geneva-based International Social Security Association (ISSA) makes a convincing economic case for investment in safety and health equipment. Observed from an international perspective, this overview underpins the returns to be gained from wise investment in worker safety. This includes organisational measures like safety and health management systems, safety training and instruction, health promotion as well as investments in safer machinery and equipment, including PPE (Personal Protective Equipment) like helmets, eye protection and safety shoes. The financial crisis brought about by global economic turmoil is affecting the safety of millions of workers worldwide. The continued economic downturn has compounded existing pressures on companies and their employees to reduce costs, including in the area of safety and health. New evidence, however, confirms that prevention of these occupational risk factors makes sound economic sense, and investment in head protection and other safety and health equipment and related measures can have a lasting and positive impact for companies. Investment in safety and health in enterprises has a direct and measurable cost benefit potential, according to a new study that the International Social Security Association (ISSA) presented to an audience of experts and policy makers, at the World Congress on Safety and Health at Work, in Istanbul last September. The International Labour Organization (ILO) calculates that each year more than 2.3 million people die and tens of millions are injured in the world, as rapid changes in the world of work bring new risks and dangers to the workplace. The ILO estimates that 2.02 million of these fatalities are caused by various types of disease and 321,000 from work related accidents. This equates to an average of more than 6,300 work related deaths every day. Recent research has shown that more than 317 million workers were injured in accidents that resulted in absences from work of four days or more, many of these because of the absence of, or inadequate use of, safety equipment. This equates to an average of 850,000 work injuries per day. When workplace injury figures are analysed more closely, the importance of personal protective equipment (PPE) is confirmed. In a study of the countries of the European Union, for example, 44 percent of the victims of non fatal accidents and 62 percent of the victims of fatal accidents were injured by contact with or collision with an object. Besides the unacceptable human toll, work related accidents and diseases can also result in massive financial costs. The direct and indirect costs of work related accidents and ill health have been extensively researched and documented in recent years. The financial burden of compensation, healthcare, rehabilitation and invalidity on the economy could be as much as 3.8 percent of national GDP in industrialised countries, and even higher in some developing nations – more than 20 times that of official development assistance. The overall costs of accidents and ill health are often much greater than immediately perceived. Conversely, investing in safety equipment such as PPE and other safety measures at work reduces both direct and indirect costs. Reduced social security and healthcare costs mean lower taxes, better economic performance and enhanced societal benefits. A recent study by the Bureau of Labor Statistics (BLS) concerning work related accidents and injuries finds that most workers who had head injuries were not wearing head protection. Certain occupations are obviously more hazardous than others, although construction, transportation and agriculture/forestry/fishing industries rate statistically high in terms of the incidence of Traumatic Brain Injury (TBI) fatalities. Consider this against the fact that after sprains, strains and back injuries, head injuries rate next highest on the list of workplace injuries, and it’s clear head protection should be a priority in the sectors cited above. All safety helmets worn on construction sites should conform to quite specific EN standards and remember, the purpose of all PPE - including hard hats - is to control or eliminate hazards or exposure to illness or injury. Ensure your workforce is vigilant about their use. Advances in the use of protective safety equipment and improved safety procedures in many industries have led to a reduction in the incidence of workplace injuries globally. 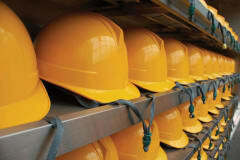 New occupational safety and health risks are emerging, however. The growth in informal employment and increased migration have combined with emerging risks associated with new technologies (including nanotechnologies), psychosocial pressures and ergonomic strain, to make the challenges to occupational safety and health more complex. In the future, work related illness – in particular chronic diseases like mental health problems – are likely to become a more pressing problem for society than occupational accidents. A growing body of evidence confirms that investments in prevention, including safety equipment and measures to promote the safety and health of workers, far from reducing competitiveness, can have direct benefits for the productivity and budgets of enterprises. A recent study on the economic costs and benefits of prevention investments coordinated by ISSA compared data from 300 companies in 15 countries in the Europe, |North America and Asia-Pacific regions. The study looked at data on interventions and analysed practises in a range of companies. The results of the study indicate that the potential cost benefit ratio for investment in prevention may be as strong as 1:2.2 – a return on investment of more than 200 percent – and even higher for targeted interventions, as, for example, investments in preventive medical check-ups and safety training. Companies also indicated other benefits that resulted from investment in occupational safety and health measures, and mentioned in priority increased employee motivation and satisfaction, better corporate image and prevention of disruptions (Figure 1). In addition, according to 75 percent of the companies interviewed, additional investment in occupational safety and health will lead to company costs remaining the same, or decreasing over the long term. The conclusion of the international study is that investing in safety and health at work not only contributes to the health and wellbeing of the workforce, but also to the economic performance of the enterprise. Prevention measures should thus not only be taken to fulfil the legal obligations of employers, but also because they make economic sense. The results of a related study carried out for the European Commission reach similar conclusions. The Commission’s report on the socio-economic costs of accidents at work and work related ill health, published in 2011, sought to establish the operational costs of work related accidents and ill health. The report analysed extensive data and cases of accidents at work in the 27 EU member states. These were then compared to the necessary investments for related measures that have or could have prevented these accidents or diseases. The report reached conclusions in three areas. Firstly, accidents at work and work related ill health hinder economic growth, their consequences go beyond the workplace, and costs are partly shifted to society and individuals. Secondly, the costs of accidents at work and work related ill health are considerable, increase company costs and decrease their revenues. Calculating these costs raises awareness about the necessity of prevention. Thirdly, the report indicates that investing in occupational safety and health contributes to company performance through tangible outcomes and yields positive results. Safety and health in the workplace has been a central concern of social security systems since the first social security scheme was established more than 125 years ago in Germany. Beyond the traditional focus on accident prevention, compensation and rehabilitation, social security systems have increasingly fostered preventive approaches to protect and promote workers’ health. Preventive approaches broaden the nature of social security policies. They are a key element in what the ISSA calls dynamic social security, which encourages proactive and preventive approaches, including investments in workers’ health, and which hinges on providing good practise information, research, expert advice and platforms for members and other stakeholders to exchange on innovation in workplace health promotion, active employment policies, rehabilitation and reintegration. Preventive safety and health strategies can substantially reduce work related accidents and illness levels, diminish the related human suffering and avoid the resulting economic losses. Global incident rates for fatal accidents have over ten years (1998-2008) been reduced by more than one third, according to the ILO, while incidence rates for fatal diseases are stagnating. The EU has witnessed a decrease in incidence rates of 17 percent in fatal accidents and a 20 percent reduction in accidents between 2002 and 2004. Social security experts estimate that in Germany accident prevention since the 1960s has saved industry up to 10 billion euros annually. Safety and health at work is a basic human right, and a societal responsibility. With a dramatically changing world of work, the demands on prevention are growing, as workers’ health is increasingly influenced by both occupational and non occupational factors. More holistic, integrated and individually oriented approaches to prevention are therefore needed, that not only address traditional occupational health risks, but also the broader health, employment and social context of the individual worker. There is a growing awareness that safety and health at work is a societal responsibility which involves a wide range of factors to complement and support the traditional prevention efforts by governments, workers, employers and occupational safety and health specialists. Increasing collaboration and coordination among the various factors will be needed, and may require a change in occupational safety and health practises and competencies in the workplace. Safety and health at work must be placed high on national and international agendas so that a continuous improvement in prevention in the workplace can be achieved. Promoting a safety and health culture will require making use of all available means to increase knowledge and understanding of the nature of risks, and how these may be prevented or controlled for all those involved. A well functioning occupational safety and health system brings positive effects not only to employers and employees, but ultimately to society as a whole. The case for promoting a global culture of prevention has never been stronger.